News & Events » Environmental Law Alert Blog » Is BC’s flooding an unnatural (climate) disaster? And if so, can we talk about it? 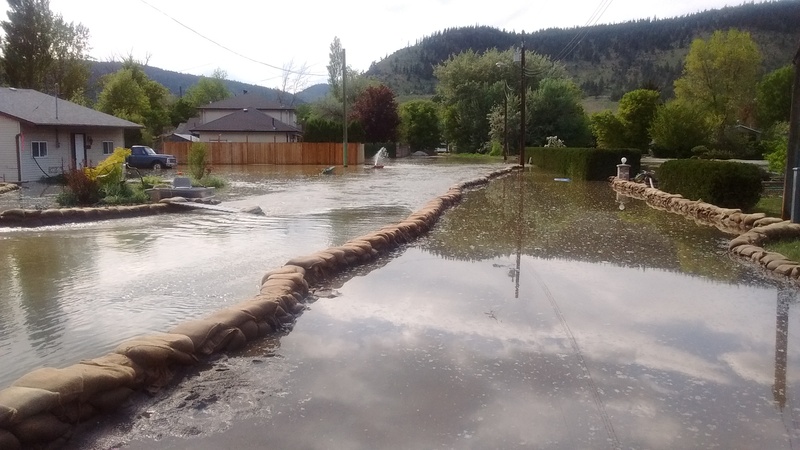 On a long weekend trip, my family drove through Merritt, one of the communities hit by recent flooding in BC. The worst of the flooding was over, but I was still dismayed to see flooded houses with pumps running non-stop to get the water back behind a sandbag barrier, to see pavement crumbling where floodwaters had washed away the underlying soil. My 12-year-old daughter, choking back tears, asked me if there were kids who lived in those houses. I spoke with a resident who told me it had been far worse just days earlier, but I couldn’t begin to imagine waking up and finding that my whole neighbourhood was underwater. Is this climate change in action? My work focuses on climate change, so perhaps it is not surprising that I see this flooding – and the flooding in other parts of BC – as evidence of climate change. After all, the rapid melt of snow pack this year was caused by warmer than normal temperatures. I’m not alone in this. A recent poll by EcoAnalytics found that 85% of Canadians felt that climate change had played some role in the "significantly warmer temperatures, flooding, wild fires, droughts and hurricanes" experienced recently in North America (and 47% felt that climate change had played a large role). But believing that this year’s flooding was made worse by climate change is not the same as having scientific proof that it was. There is a growing body of scientific work that does link particular weather events to climate change, but doing that for these floods would take both time and scientific expertise that I don’t have. What we can say for now is that floods of this type are going to occur more frequently as a result of climate change. The extreme weather events of 2017 were separate incidents occurring at different times of the year in distinct parts of our province. … What became clear to us during this Review was the undeniable impact of climate change manifested in these events. What are the benefits of talking about it? Even if we know or suspect that climate change caused the recent flooding, should we make a big deal out of that? Sometimes people suggest that it is disrespectful, insensitive or opportunistic to talk about the climate crisis at a time when people need basic assistance getting back on their feet. In his book Don’t Even Think About It: Why Our Brains Are Wired to Ignore Climate Change, climate communications specialist George Marshall points out that communities that have been through a traumatic event like a flood are looking for normalcy, and do not want to think about the fact that climate change will make future floods more likely. But for those of us who believe that the flooding – and droughts and wildfires – that we have seen over the past few years are our new normal, it is difficult not to speak. I think that there are good and important reasons to talk about climate change when we have a real-life example of what our future may look like. The benefits in terms of raising public concern about climate change and encouraging real action to transition to a more sustainable economy are probably obvious. When we think of climate change as being about polar bears and people in far-off island nations, it can be difficult to persuade people that this is an urgent problem. Flooding in BC puts more recognizable names and faces to the victims of climate change. In addition to raising awareness and concern, talking about the impacts of climate change here in BC can also help protect British Columbians and help us prepare for the future. diking infrastructure will likely not be sufficient in the face of increasing flood risks. Emphasizing the role of climate change in BC’s flooding and wildfires helps put pressure on the province to ensure that flood prevention is adequately resourced and that the tools are in place to help communities avoid the types of flooding and other climate impacts that are being experienced. Talking about the role of climate change in these types of disasters also allows us to confront the huge costs of the climate crisis already facing our citizens, communities and province. Not preparing for climate change has massive financial costs to individuals and communities, including affecting the credit ratings of impacted communities. Preparing for climate change will be cheaper than dealing with severe climate impacts in the long run, but it will still be hugely expensive. When we talk about how profitable the oil and gas sector is, these are the costs that we are ignoring. The costs of flooding are currently being paid by governments and taxpayers, by private donations through the Red Cross and other charities, possibly through insurance policies (although many residential policies exclude overland flooding) and, of course, by the victims of the floods. Right now, the focus needs to be on getting assistance to the flood victims to help them rebuild. However, as floods and wildfires become more frequent, it will be increasingly difficult for governments to come up with emergency funds – or at least for those emergency funds not to come at the expense of healthcare or education or possible increased taxes. And even if those immediate needs are addressed, the costs to help prepare our communities for flooding and other impacts are also currently falling to taxpayers, as represented by our federal, provincial and local governments. The federal government recently pledged $2 billion over 10 years towards climate adaptation, which is a drop in the bucket compared to what is needed. For example, on the BC coast, $9.5 billion is needed between now and 2100 to protect Lower Mainland municipalities from flooding due to sea level rise (according to the BC government). And in BC's interior, not only was $½ billion spent fighting forest fires in 2017, but an estimated $6.7 billion is required to treat moderate- to high-risk wildland-urban interface areas to prevent future forest fires. And those are only a few of the many climate impacts that we need to guard against in BC. Right now, many communities are not implementing the climate adaptation measures that they have identified because they don’t have the funds to do so. Notably absent from those contributing to climate change emergency funds and adaptation are fossil fuel companies (except to the extent that they, like other businesses, pay taxes). These corporations are getting off the hook, despite the fact that they have made billions of dollars selling products that they knew would contribute to climate harm. Communities across BC are increasingly recognizing that fossil fuel companies need to pay their fair share of local costs. Until the fossil fuel industry takes cradle-to-grave responsibility for its products, Chevron, Exxon Mobil, Shell and other companies are not going to have any economic incentive to start working quickly towards a post-fossil fuel pollution economy. And until we collectively move to a post-fossil fuel pollution economy, the climate risks to our communities will keep getting bigger, more life threatening and more costly. If we treat each disaster as a one-off, a “natural” disaster, we’re not going to have the discussion we need. What we need is a conversation about how all of us – including those that have benefited most from fossil fuel pollution – can get people back on their feet after climate disasters and take action to protect people from climate impacts. Floods and wildfires worsened by global warming allow us to see the impacts and implications of rising global temperatures, but only if we are brave enough to recognize that these are un-natural disasters. They are part of the future that our fossil fuel economy has created for us. To make progress, we must not be afraid to talk about the connections between the climate crisis and flooding, wildfires and storms. And we need to go beyond talking about those connections – and to actually take steps that will protect Merritt, Grand Forks and all BC communities. We need to recognize that our province will experience more of these un-natural disasters in the coming years, and that all of us will need to step up to help the people harmed by them and to build resilient communities that can withstand them. We need to demand that our governments play their part. This means both planning and budgeting for un-natural disasters, and helping to prepare our communities for these risks. It also means that our governments should not simply pass all of the resulting costs on to taxpayers – they should ensure that fossil fuel polluters also pay their fair share. Whether through Climate Accountability Letters, litigation or legislation, global fossil fuel companies need to know that they will ultimately be responsible for the true costs that their products impose on our communities. (See our Climate Law in our Hands campaign for some of the tools communities are using to demand global accountability for climate harm). During a time of disaster, it is tempting to ignore controversial issues and focus on unity. But if that means that we are failing to learn and prepare, to ensure that we have plans in place for future disasters and accountability for those who contributed to these threats, then we are not doing any service to the victims of those un-natural disasters.